In advance of the KIND MUSIC FESTIVAL–set to take place Saturday, February 23 at the future site of Tyson Ranch Resorts, a 420-acre Desert Hot Springs, CA–city officials have weighed in with their support for the inaugural event while the team continues to create a festival site surrounded by the scenic desert landscape. “It is a great honor to host the inaugural KIND Music Festival in our City and we look forward to building a long-term partnership with Tyson Ranch through this venture,” says City Manager Charles L. Maynard, City of Desert Hot Springs. The one day, all-ages festival pop-up event will feature a recently updated line-up that includes performances from MIGUEL, FERG, STARCRAWLER, REESE LAFLARE, YONEE, D.I.E. and ALL MY FRIENDS HATE ME. 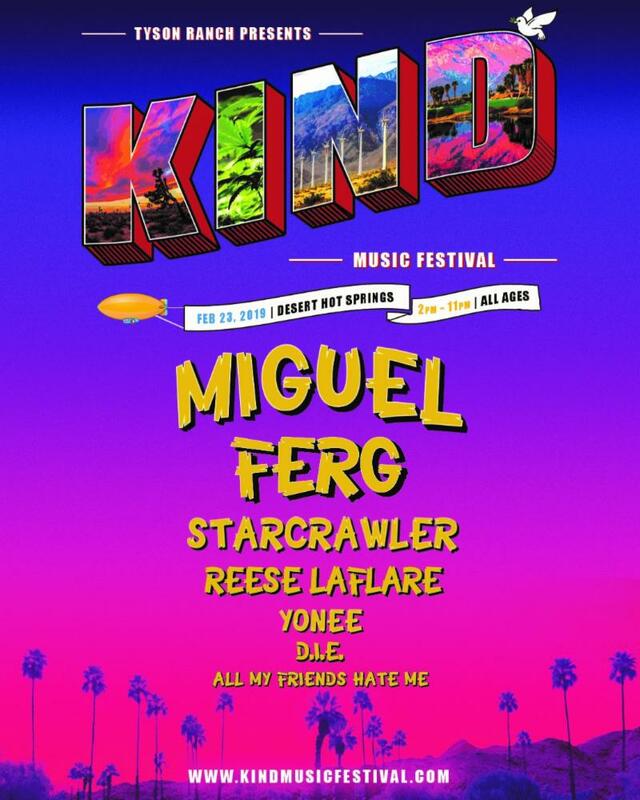 The KIND MUSIC FESTIVAL will mark the first event at the Tyson Ranch Resorts, a 420-acre Desert Hot Springs, CA entertainment complex, luxury glamping resort, and cannabis research & design facility created and owned by Mike Tyson. This entry was posted in KIND MUSIC FESTIVAL, Press Releases. Bookmark the permalink.